In Utuado, a town in the hills of central Puerto Rico, “very little works.” That’s what Delsie Gandia, a resident, told me several days ago via email during a rare opening when she could connect to the internet. Since Hurricane Maria’s 150-plus mph winds scoured the island into a mass of rubble and smashed infrastructure on Sept. 20, residents have been showering in the rain and washing clothes by hand with spring water, she said. Electricity had been restored to Utuado proper, but, said Gandia, “As I write, we have been plunged in darkness once again.” Roads are washed out or blocked by debris; damage to the local communications tower and unreliable power hampers phone and internet services. 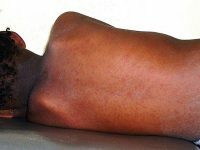 Many people were cut off from relief, emergency health care and other services. Utuado’s mayor, whose rural home was destroyed in the storm, hacked his way into town with a machete, she was told. Across the island, several hospitals are operating off generators, and schools and thousands of businesses are still closed. The bankrupt power authority, working with the U.S. Army Corps of Engineers and crews from Florida and New York, struggles to clear millions of tons of debris, replace thousands of damaged poles and reconnect the island’s grid. As of Nov. 30, the government reported just over 60 percent of residents had power. The Army Corps of Engineers’ chief engineer estimated it could take nearly a year to get full power restored. 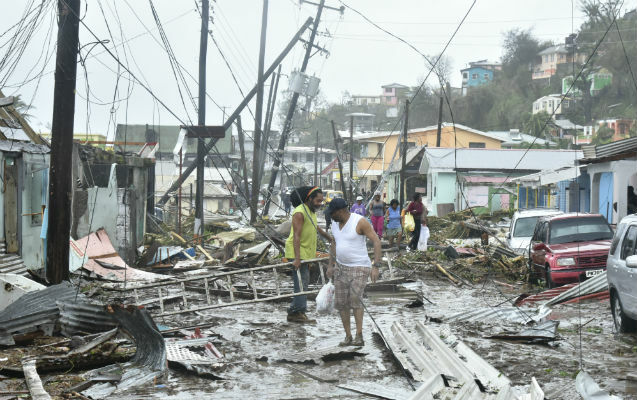 Less than a week after Maria hit, an informal group of people from around the Earth Institute started talking about how the institute can help develop a long-term reconstruction plan for the island. They are joining an ongoing conversation among non-profits, academics and private companies on and off the island. With experts in macroeconomics and economic development, energy, agriculture and other pertinent fields, the Earth Institute “can contribute to thinking on what would a more sustainable and resilient Puerto Rico look like in a decade or more from now?” said Glenn Denning, a professor at the Columbia University School of International and Public Affairs who co-chairs the informal group. That could mean better housing, improved agriculture and food systems, and a more resilient energy supply. But as of right now, the feasibility of rebuilding sustainably remains problematic, said Denning. Politics may be the first obstacle: In Washington and on the island, Puerto Rican authorities, federal agencies and Congress, which oversees administration of the island, have been squabbling over money for relief, the island’s debt and who should control what. 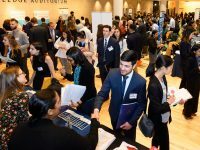 “We have to reimagine how we’re going to rebuild,” Miguel Soto-Class, founder and president of a Puerto Rican think tank, Center for a New Economy, told the Associated Press. Soto-Class is a co-chairman of an advisory commission set up by three large U.S.-based foundations who have pledged at least $5 million toward recovery. A number of private organizations have jumped into the gap. Because the electric grid underpins vital services such as water, food, health care and communications, many are focused on small-scale solar power, which can be tied to the grid but also operate independently if the grid goes down. 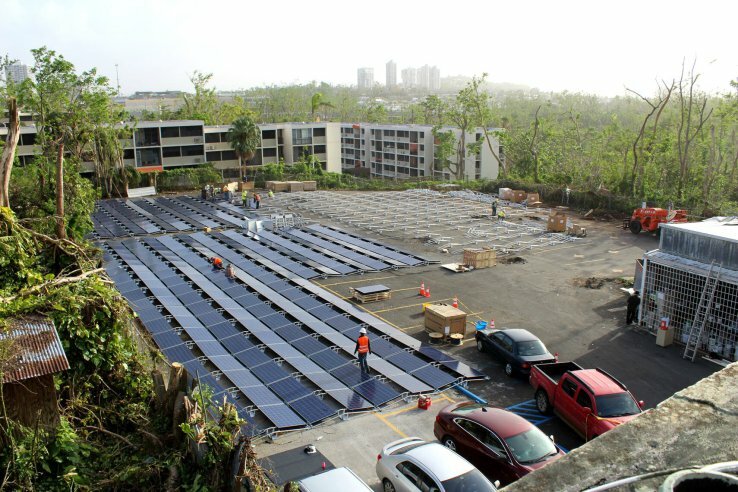 Tesla has installed a solar array to provide power to a children’s hospital in Guaynaboa and shipped hundreds of battery systems to the island for the relief effort. Puerto Rican authorities are talking to Tesla and other solar and battery tech firms about longer term prospects for rebuilding the power system, Bloomberg reports. Another company, Sunrun, is helping to install solar emergency power systems at fire stations. Sonnen, a German company that makes electricity storage systems for solar power, is subsidizing installation of several projects around the island. 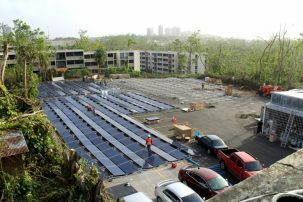 Resilient Power Puerto Rico, a Brooklyn-based project, is enlisting “solar brigades” of local volunteers on the island to install 2-kilowatt mobile solar electric systems to help the worst-hit communities charge phones and tools, filter water and provide light. The next goal is to deliver 100 community solar stations in 100 days—20- to 40- kilowatt units large enough to fully power a community center, small business or other gathering place. Puerto Rico currently relies heavily on imported oil and coal. As a result, electricity is more expensive than on the mainland, and the central grid more vulnerable to storms that can shut down power plants and disrupt port activities. And PREPA, the Puerto Rican power authority, is bankrupt, mired by $9 billion in debt. The agency is a victim of the island’s sagging economy; but also, by its own account, it is plagued by poor management, expensive labor contracts and badly maintained infrastructure. As part of its restructuring plan, PREPA wants to increase use of renewables from 3 percent to 18 percent, most of that solar, and shift heavily toward natural gas from oil (the plan also would increase reliance on coal from 17 percent to 22 percent). Some say that doesn’t go far enough. Meyer envisions the whole island shifting to 100 percent renewable power, mostly solar, within two years. He said solar companies are flocking to the island because they see a chance to tackle the problem on a larger scale than ever before. “We’re literally at the scale of a state in terms of geography and complexity — it’s the equivalent population of Connecticut,” he said. If they can succeed in Puerto Rico, you can start to see other states following suit, Meyer said. His project is delivering solar power for $1 per watt, a tenth the cost of solar power in New York City, Meyer said. But it is also being funded by donations. Meyer says converting to off-grid power will take a combination of privately subsidized and market-based development, and big investments by government. There are other ways to help Puerto Rico rebuild sustainably and weather the next storm. 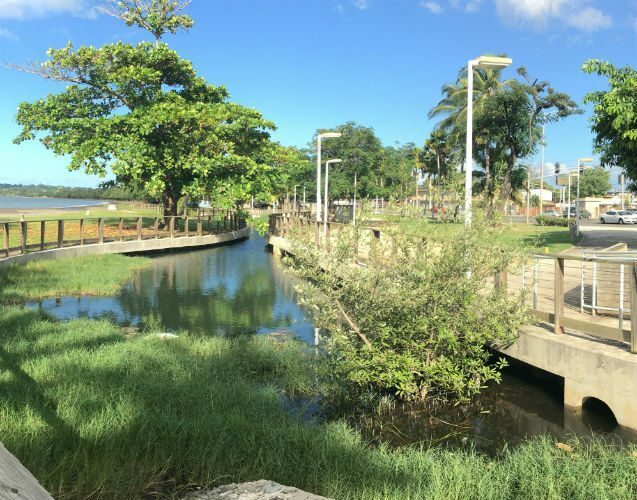 Several years ago, Meyer’s landscape firm converted a derelict strip of coastland at the Parque del Litoral in Mayaguez into wetlands, dunes and coastal forest to absorb runoff and protect the city from storm surges and tsunamis. It worked; despite Maria’s waves and heavy rain, local businesses stayed dry and were able to reopen within a week, Meyer said. The project also redirects drainage to protect coral reefs from polluted city runoff. Two ways to help: Resilient Power PR needs student volunteers on Friday, Dec. 1, from 9 a.m. to noon to help load pallets of solar panels bound for Puerto Rico. The location: 232 6th St. between 3rd and 4th Avenue in Gowanus, Brooklyn. Bring light work gloves. On Saturday, Dec. 2, the organization will hold a benefit concert at the Rockaway Brewery in Queens. Check their Facebook page.